A hundred or so Eurekans experienced a strange thing last week: A well-attended public meeting — about a major proposed development on a large, key piece of bayfront property — that was nearly devoid of rancor. It's hard to say what resulted in the unilateral positivity; maybe those "I Like Eureka" stickers are really working. Or maybe Community Development Director Rob Holmlund concocted the perfect amalgamation of public and private sector forces and unleashed them at a time when people are feeling optimistic about the community and the economy. Holmlund invited the public out on a gray Wednesday to look over detailed proposals for the vacant three-block space on Eureka's waterfront between C and F streets. It stretches from the Bayfront Restaurant building to the Fisherman's Terminal Building, which recently welcomed Jack's Seafood after years of sitting vacant. HealthSport occupies one of the lots, the falling-down Buhne Building another, but most of the space is a big gravel lot that attracts overflow parking and seagull-feeders. Holmlund has been working for the last six months to develop a community vision for the space, which was originally Wiyot land. Last July, he held meetings to gather public input on what features people would like to see in the plans. Arcata architect Kash Boodjeh developed five sketches incorporating different features people recommended: theaters, hotels, outdoor stages, farmers markets, a Wiyot cultural center and more. After sitting down with Holmlund and others this year, Boodjeh synthesized those five drawings into a sixth that they believe adheres to the public input and practical concerns — though Holmlund pointed out that it's strictly an overarching vision for the site, not a finalized design. Shown above, the design features an outdoor stage, small theater or indoor marketplace and apartments in the eastern block. The central block is filled by an "H" shaped hotel with a connecting second-story wing. The western block is an ode to the Wiyot, and features a cultural center, meeting place, museum and park area, among other things. The designs also feature "compatibilities" with Eureka, Holmlund explained, like alleyways, and focused on lines of site to the bay. At the Feb. 24 meeting, Boodjeh, Holmlund and a six-person panel discussed the merits of the designs and opined on the practicalities of development. The city of Eureka owns much of the property between C and F streets, and Holmlund said the goal is to sell it to private developers who will build projects like the ones shown in the designs. Former City Manager David Tyson said that will require help from the city — pre-permitting, for example, will encourage investors to start building. Holmlund said he hopes to see construction in the next couple years. Holmlund's office is currently doing a detailed parking analysis expected to show what kind of impact the proposed developments would have. The idea of a parking garage, located elsewhere, came up several times. Panelists agreed the space has to have an anchor business to be successful, and the consensus was that a hotel, whether a boutique upscale inn or part of a chain, would make sense. But that alone wouldn't be enough, said Mark Jones, an Old Town property owner and developer who sat on the panel. "People have been looking for an outside investor to come in and save us all," he said. "That hasn't happened, I don't think it will happen. It has to be small patchwork community investment." That means a variety of uses — housing, offices, retail and restaurant space — that attract locals and tourists in equal measure. One audience member expressed concern about Eureka's waterfront becoming like San Francisco's Pier 39, which sells "plastic crap from China." Scott Pesch, a commercial real estate agent who sat on the panel, said he had concerns about adding new retail space when Eureka has vacancies in the Old Town and downtown areas. Holmlund's office is also conducting a vacancy study for Old Town properties. But Pesch said an attraction like a bustling waterfront area can help fill empty storefronts downtown. He pointed to Arcata as an example; when he went to HSU in the 1980s everything was in view of the plaza, he said. "Now, it's three, four, five blocks beyond the square," he said. The strongest voice of concern came from Old Town resident and Journal columnist Barry Evans, who stood up from the audience at one point and said he couldn't see anyone investing in the property while the boardwalk remained a gathering placed for homeless people and drug users. "The boardwalk is not a safe place in the evening," he said. Holmlund quickly dismissed the concern, saying the city has adopted an 18-month strategy for addressing homelessness and that it represented an overall different issue. But panelist Astra Burke, who owns Many Hands Gallery, expressed similar concerns. She said safety is a major worry among tourists who shop at her Old Town store, and the image of Old Town makes a big difference in creating "positive memories" in the area. The panelists seemed to agree that development would encourage cleanup — that a more attended, vibrant area would naturally diminish bad behavior. "That's the exact reason why we're here, is to put something positive into our community," Pesch said. After all, Tyson said, the three-block area was a "nightmare for Old Town" in the 1980s, home to piles of garbage, drug activity and murders. Since the city purchased the property with redevelopment funds in the 1990s, the area has gotten safer and closer to development. But it's been a slow process, and it remains a huge undertaking. "It's not an easy site to develop," Tyson said, and the city no longer has redevelopment money from the state. Laurie Lazio, a longtime Old Town figure who attended the meeting, said he thought the concepts were wonderful but said every waterfront development in Eureka he could remember was funded by redevelopment. "We're still figuring that out," Holmlund said. "Just because it's hard doesn't mean we aren't trying." And projects will need to take into account sea level rise. Steve McHaney, an engineer with GHD in Eureka, said after the meeting that the Coastal Commission requires waterfront developments to account for sea level rise through 2050, sometimes 2100. Depending on which study you reference, he said, that could mean tides 6 feet higher than they are today, on a waterfront where little else is being done to prepare for the rise. Still, Holmlund said he was confident that developers could break ground in the next several years. In the meantime, he said, the city will look for interim uses for the empty lot, and he'll take his office's preferred design before the city council in the near future. Pink Area: The anchor, an H-shaped hotel connected by a covered outdoor walkway and featuring an indoor pool, a café, retail storefronts along First Street and about 100 guest rooms. 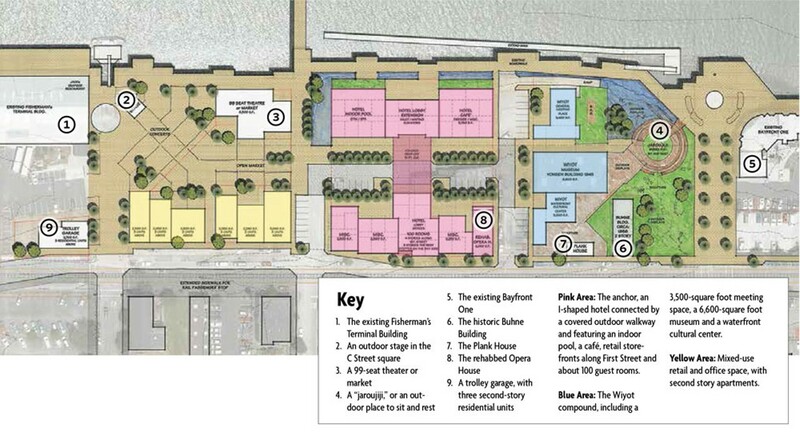 Blue Area: The Wiyot compound, including a 3,500-square foot meeting space, a 6,600-square foot museum and a waterfront cultural center. Yellow Area: Mixed-use retail and office space, with second story apartments.